He fills Dustin Hoffman's heels in the Broadway musical. Fans of Crazy Ex-Girlfriend were filled with mixed emotions when Skylar Astin recently appeared on the show as Rachel’s messy, sort-of ex, Greg, who previously fled to graduate school. Although we loved Astin in Pitch Perfect and the original Broadway run of Spring Awakening, he had some big shoes to fill in replacing Santino Fontana, who originated the role in the CW show. But Fontana is busy filling his own big shoes...or in this case, heels. He’s taking the lead in the upcoming Broadway musical version of Tootsie. Directed by Sydney Pollack, the 1982 film starred Dustin Hoffman and Jessica Lange. It’s about Michael Dorsey (Hoffman), a New York actor who can no longer find work. In a desperate attempt to land a part in a soap opera, he reinvents himself as actress, Dorothy Michaels. During his gender-bending portrayal, he falls for his costar, Julia (Lange). 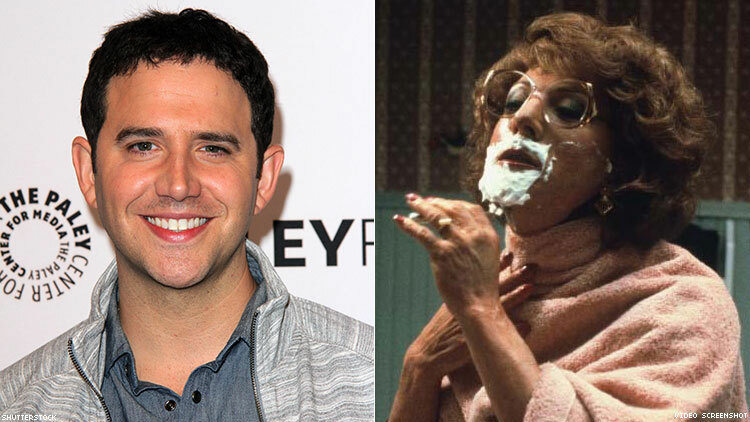 Entertainment Weekly has just released an exclusive first image of Fontana in full drag for the role. Paying tribute to the original, he rocks a red wig and a red sequin dress while shaving his face for the perfect fishy illusion. In addition to Crazy Ex-Girlfriend, Fontana gave a Tony-winning performance in Rodger’s + Hammerstein’s Cinderella, and he voiced Hans in Frozen.